Well, the Fasig-Tipton Fountain of Youth certainly was no fluke. When it comes to combining brilliance with staying power, he stands alone among this year’s 3-year-olds. Only thing left is to see what he can do with a fast pace. His high cruising speed and ability to run his opponents into the ground with little effort make him a legitimate Derby favorite. Whoever named this colt apparently put the whammy on him. If there is a horse who can use some good luck it is him after three consecutive nightmare trips. He lost all chance in the SA Derby after having to take up badly at a crucial point in the race, but still finished well to finish third. Like the way he accelerated between horses and ran on strongly. Didn’t you get the impression the Santa Anita Derby was over after a half-mile? He always seemed in complete control while setting another slow pace. For a speed horse he sure can motor home, which makes him very dangerous. He actually could turn out to be the only true speed in the Derby, depending on who runs. And when a speed horse can close in :35 3/5 (even on a synthetic surface) good luck trying to catch him. Yes, he’s still here. No use lowering him now with the Toyota Blue Grass Stakes coming up. Persistence can be a good or bad thing on the Derby trail. We’ll find out soon which one applies in this case. Still want to see him back on dirt, but the Blue Grass will at least serve as a good gauge how he measures up against some top-quality horses from the East. 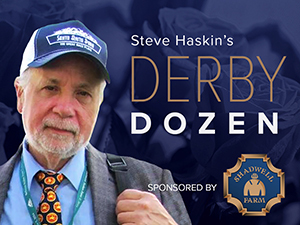 His one-for-seven career record is not the kind of statistic you want to bring into the Kentucky Derby, but as I’ve said before, I believe this horse will be far superior on the dirt, and is one horse who looks ready to peak on Derby Day. He lost a ton of ground in the SA Derby and flew home his final eighth in :11 3/5. Earnings still a bit of a question. Getting beaten a dozen lengths by Eskendereya is not a blot on the record anymore, and in fact is becoming commonplace. He is a horse on the improve, and is in good hands, and that makes him a legitimate threat in the Derby. But the six-week layoff still is a concern. Main difference between him and archrival Pleasant Prince is he already has the earnings to get in the Derby. He stumbled at the start of the Wood, lost a shoe, and was victimized by a slow pace. Not sure if he wants to go 1 1/4 miles, but he's a talented horse and certainly deserves another chance. He needs to have his move timed right, and if he gets the trip he should improve big-time and could be ready to peak on Derby Day. It’s starting to look as if the only way to beat Eskendereya is from the back of the pack and hope the pace is fast enough to soften him up. That doesn’t bode well for this colt’s style of running, but he is getting very good right now. He could be one of five WinStar horses in the Derby if Super Saver moves forward at Oaklawn and Drosselmeyer runs in the Coolmore Lexington Stakes and picks up sufficient earnings. Can he get a clean trip in the Arkansas Derby? Can he stretch out to nine furlongs and still be effective? Those are the key questions that should be answered. A win or very strong second would move him up the list. Want to see him show signs that nine and 10 furlongs are within his range. Have no idea what to expect from him on the Keeneland Polytrack in the Blue Grass. Schoolyard Dreams didn’t boost the Tampa Bay Derby form in the Wood, but who knows how good this horse is and how good he can be with maturity? There is no reason why he shouldn’t be right there in the Arkansas Derby. He always is. Because it is only his second start of the year and first at 1 1/8 miles, he needs to run a strong final eighth and show he can keep going. So tough to choose among him and other Pletcher horses like Super Saver, Rule, and Aikenite. He does have the right running style, is improving at the right time, and has already secured his place in the Derby. Sorry, had to go to a baker’s dozen again this week. It’s difficult to get a true assessment of his Illinois Derby victory. He took advantage of a track and race that normally favors speed and defeated a horse with distance question marks. But you had to love the 11 1/4-length gap to third. Horses were coming home slowly all day, so his :13.07 final eighth was actually OK.